On May 16th  enrollment jumped 5,890 to a total of 62,450, the next day added 8,100 men, the next 10,500 men. On June 1st a peak daily enrollment of 13,843 men was reached. The average daily gain in actual strength for this period was 8,700 men. During part of May 150,000 men were in reconditioning camps being organized and equipped for the field. By June 7th, 253,200 men had been enrolled, and by July 1, the enrollment of local men had increased this figure to 296,700. Of these, after deducting losses from all causes 270,000 men occupied 1,331 work camps in the forests of the country by June 29th. 55,000 men in 335 companies were transported from the eastern corps area to the far western states of the Ninth Corps area. A comparison with world war accomplishments is interesting. During the corresponding first three months of the world war, the War Department mobilized by July 1, 1917117,000 men in the regular army, 58,000 in the National Guard, and 6,000 in the National Army, or a total of 181,000 men. By that date less than 16,000 men, mostly regular army units had embarked for France. The processing of over 250,000 men in such a short time was no mean accomplishment. 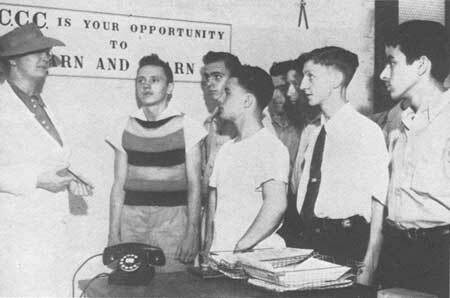 Before his enrollment each one of those young fellows was personally interviewed by welfare officials, who determined that the man needed employment and that his family was in need of substantial support from his earnings. The interviewers had to establish that the enrollee was a citizen of the United States, between seventeen and twenty-eight years old, and unmarried. They had to be satisfied that the enrollee, if finally accepted, could perform hard work without injury to himself and was free from communicable disease. They obtained a good record of his past experience, his interests, and his general character. After personal interviews, CCC enrollees were given information and guidance by a welfare official. 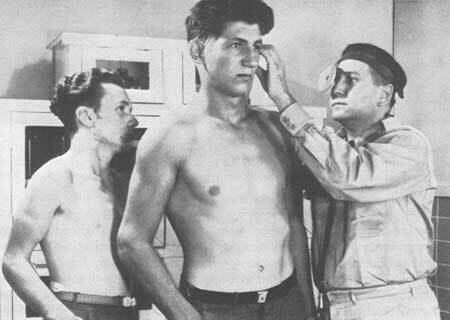 An important step for the CCC enrollee was his physical examination before entering on duty. If the welfare officials felt the man met CCC standards and qualifications, they asked him to report for medical examination to make certain that his health would permit him to do hard work. Only after having passed the army's physical examination was the man formally enrolled in the Civilian Conservation Corps. He was then given a good meal and assigned to a group of young men who were sent with an officer or leader aboard a train or bus to a Civilian Conservation Corps camp. 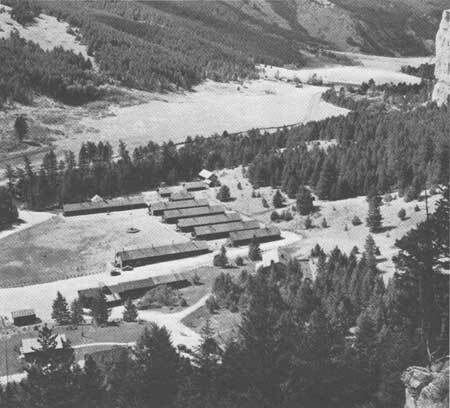 A typical CCC camp provided housing for two hundred enrollees, quarters for the military camp commander and staff and the supervising agency's superintendent and staff, medical services, recreation facilities, equipment storage and repair shops, and a mess hall. All set to go to work, the new CCC enrollee totes away his issue of clothing and bedding. When the young man arrived at camp he was furnished with complete outfits of work and off-duty clothes and was assigned a bed in one of the barracks. 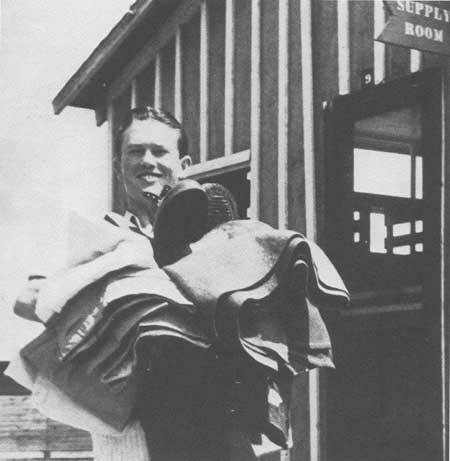 The clothe's he wore on arrival were put away until he finished his service with the CCC. Within twenty-four hours after arriving at camp he was vaccinated against smallpox and given his first anti-typhoid inoculation. He was also given a pneumonia inoculation if he volunteered for it. On the day the enrollee arrived at camp the company commander welcomed him and explained the general rules of the camp. Then the enrollee, depending on his individual need, was given one to three weeks of physical conditioning before joining the work crews. This conditioning was done under the camp commander's supervision and consisted of light duties around the camp along with good food, regular hours, sufficient sleep, and medical observation. In the beginning these conditioning periods were given at a military post. This period provided an excellent time to instruct the enrollee in disease prevention and safety. 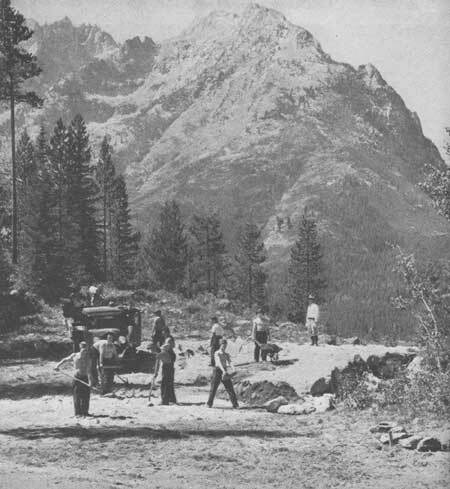 A CCC crew grading an overlook along a mountain road. It is interesting to note some of the items that the military bought for the boys initially enrolled. About 1,061,000 pairs of service shoes were purchased for $2,824,000, or a little more than $2.66 per pair; approximately 295,000 raincoats, for about $953,000, or a little better than $3.16 each; and, the prize purchase, 3,600 motor vehicles, at a cost of a little more than $591 each. A sampling of some 15,000 boys showed that they gained an average of 277 inches in height and 7.23 pounds in weight in the first six month's in the CCC.